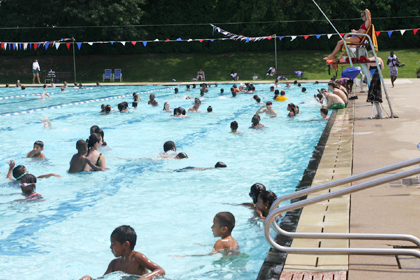 SUMMER IN PRINCETON: One place to beat the heat last Saturday was at the Community Park Pool. There has been a 22 percent increase in the number of cardholders at the Princeton Public Library since last spring, equivalent to more than 5,000 new members, according to a recent report from the library's Board of Trustees. Borough Council was scheduled to review staffing within the Princeton Borough Police Department at its meeting on Tuesday night, including the possibility of adding a third lieutenant's position to the force. Township Committee allowed for numerous sidewalk repairs at last week's meeting, but one plan for a walkway on Ewing Street did not sit well with some residents.